Moving science and medicine away from archaic animal use benefits doctors, their patients, and animals. And this program is a case in point. Nine countries, three continents, and thousands of animals’ lives saved. PETA has helped medical training programs in Bolivia, Costa Rica, Egypt, Iran, Jordan, Mexico, Mongolia, Panama, and Trinidad and Tobago to stop cutting apart and killing animals in surgery courses and instead start using life-like human-patient simulators. How? We purchased 64 state-of-the-art TraumaMan surgical simulators and donated them to the programs. Until now, limited budgets have prevented these programs from teaching Advanced Trauma Life Support (ATLS) courses with the same modern simulation equipment that’s standard in the U.S. and many other nations. As a result, trainees at dozens of hospitals and universities were required to cut holes into the chests, throats, abdomens, and limbs of thousands of live dogs, goats, pigs, and sheep. In partnership with TraumaMan manufacturer Simulab Corporation and with financial support from the McGrath Family Foundation of San Diego, our members, and PETA Germany, PETA was able to end these crude animal laboratories and provide thousands more doctors each year with access to the sophisticated TraumaMan simulator. This lifesaving training tool replicates the anatomy and physiology of a real human torso, including realistic layers of skin and tissue, ribs, and internal organs. 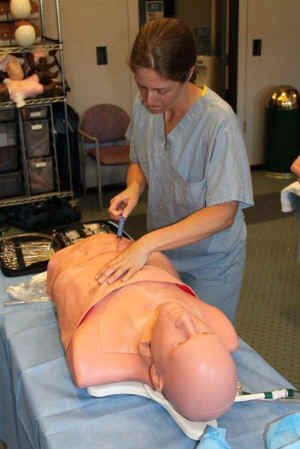 The TraumaMan simulators better represent human patients, allow trainees to repeat difficult procedures until mastered, and have been shown to teach lifesaving procedures better than cutting into animals does. As we’ve said before, moving science and medicine away from archaic animal use benefits doctors, their patients, and animals. And this program is a case in point.